Hockey players need feedback in order to improve their game. As a hockey coach, it’s your job to give it to them. But how do you know if what you’re saying is getting through to your players? How do you know if it’s helping them develop? According to a Columbia University neuroscientist, people that receive feedback apply it only 30% of the time. That means up to 70% of the time you spend providing feedback to your hockey players might be a complete waste! It turns out there are a few common mistakes that—if taken care of—can drastically improve the success rate of your feedback sessions with your players. 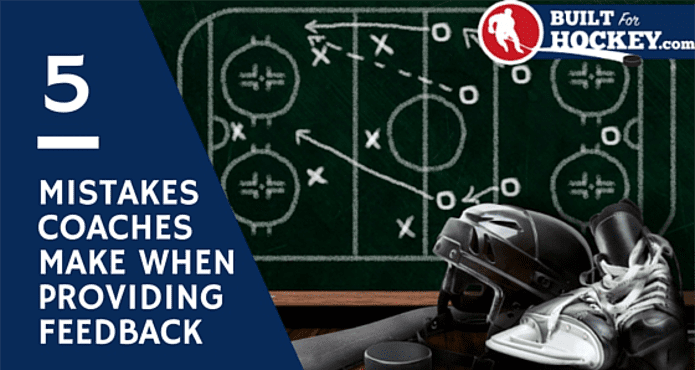 In this article, I’m going to outline the 5 most common mistakes hockey coaches make when providing feedback to their players and what to do instead so that your message actually resonates. While there are numerous mistakes that can be made when providing feedback, the 5 following mistakes are most common among hockey coaches and will have the greatest impact on your success rate if taken care of. For some reason, coaches seem to think that feedback is only required when things go wrong. The truth is both negative AND positive feedback are required for fostering growth in a young hockey player. Positive feedback stimulates the “reward system” in the brain—players realize what they’re doing is good and are open to improving further. The next time you provide feedback, they’ll be even more attentive to your message. Negative feedback stimulates the “threat response” in the brain—players realize that an adjustment needs to be made and will take the necessary actions to do so. Remember to always provide guidance or a solution that they can act on. The key is being consistent with both positive and negative feedback. A good mix will allow your players to focus on improving from negative feedback without feeling like you’re being too hard on them (thanks to frequent positive feedback). Maintain a good balance between positive and negative feedback, and you’ll improve the effectiveness of your feedback as a whole. Many coaches turn feedback sessions into never-ending stories. While it helps to put things into context, you want to make sure you get to the point before your players’ attention spans dwindle. Due to a psychological concept called the serial affect, humans tend to remember things that come first (primary effect) and last (recency effect). When giving positive or negative feedback, get straight to the point—don’t bury your most important feedback between a few anecdotes, life lessons, or any other irrelevant information! There’s a time for player-coach bonding and there’s a time for constructive feedback—try not to blend the two as you’ll inevitably miss the target on both. Your goal is to give your player one thing he can walk away with and work on improving immediately. It’s important to let your players know what they did wrong, but it’s infinitely more importantto communicate WHY it’s wrong and HOW it can be fixed. Instead of providing a simple analysis of what happened, you can make more of an impact on a player’s game by giving him actionable advice he can implement in order to fix the issue. A player that goes through this kind of feedback process is much more likely to apply the feedback than a player that’s simply told what he did wrong. When it comes to negative feedback, it can hurt to be overly aggressive. In other words, it’s just human nature to favor positivity over negativity. …but how do you make it work without coming off as overly aggressive, which can do the opposite and make your players ignore your advice? You again have to find the right balance between stern and aggressive. If you want your players to benefit from your negative feedback, you have to be stern enough that your message is heard, but not too stern that you’re seen as the enemy. As soon as a player thinks you’re always picking on him or pointing out his flaws, you’ve lost him for good. That’s why it’s extremely important to remain consistent with a good mix of negative and positive feedback like I mentioned earlier. One way to make sure you’re stern rather than aggressive is to remind players that you’re there to help. If you let them know early that the feedback (both positive and negative) is for their own good, they’ll be much more likely to accept your feedback when the time comes—even if it’s negative in nature. If you haven’t read it yet, my article on The Pygmalion Effect for Hockey Coaches dives into a concept similar to this in more detail. Last but not least, a common mistake coaches make when providing feedback is waiting until the time is right. The truth is that the best time for feedback—both positive and negative—is as it happens. The longer you wait, the more you and the player forget about the situation at hand. Details get forgotten, situations are presented without context and feedback is just less effective overall. Give your feedback as soon as you can for maximum impact and retention. Just remember to give your player the time to implement your feedback before addressing it again—you don’t want to be continuously correcting players after each attempt. You should also give players a chance to improve on their own once you’ve done your part to avoid dependence on coaching. This can have an adverse effect and create lazy players who wait around for their coach to tell them what’s right and wrong. Giving feedback as soon as possible and allowing time for implementation is your best bet at an efficient feedback process. These common mistakes are responsible for most of the issues coaches have when it comes to providing effective feedback. If you can follow these 5 simple steps laid out above and avoid the 5 common mistakes laid out in this blog post, you’ll be well on your way to providing feedback—both positive and negative—that actually gets applied. Is there anything you struggle with as a coach? Leave a comment below because I’d love to hear what you’re having trouble with.